Home » Blog » Will You Get Paid If Your Customer Files For Bankruptcy? 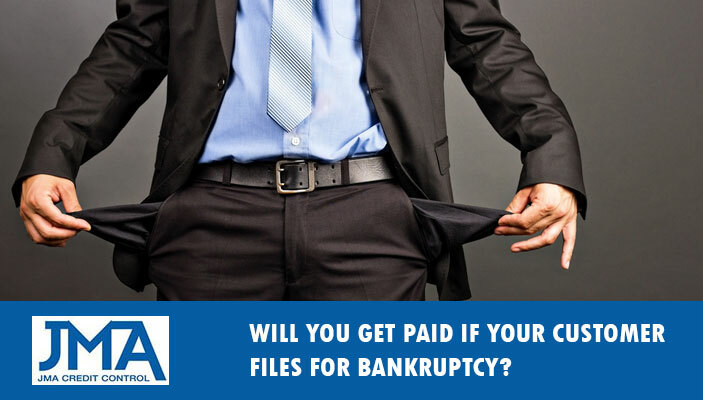 Will You Get Paid If Your Customer Files For Bankruptcy? Managing cash flow and chasing up overdue accounts can cause major stress and disrupt operations for business owners. But what are your rights if a debtor files for bankruptcy and will you get paid what you are owed? What Happens When A Customer files For Bankruptcy? If one of your customers has filed for bankruptcy a trustee will be appointed to distribute the eligible assets of the debtor and determine the priority of the debts. To try to recover your outstanding debt you will have to lodge your claim with the bankruptcy trustee. Generally any unsecured debts (meaning you do not have any legal security interest over the debtors property such as a mortgage) will be paid only once all trustee’s fees, government charges and payments to banks and other secured creditors are completed. So as an unsecured creditor your chances of receiving all the money you are owed is very small. That is why we recommend a pro-active approach to protect your cash flow. As always prevention is better than a cure when it comes to managing overdue accounts. There are a number of ways you can minimise your risks of bad debts and also steps you should take immediately once the account is overdue for more than 30 days. As a business owner who provides credit or enters into a business transaction it is important to have clear terms of trade, and to ensure that new customers are made aware of these terms before ordering your product or service. To avoid bearing the cost of chasing up overdue accounts your terms of trade should include a section that explains the debtor will be liable for all collection cost. You can then use a professional collection company such as JMAcreditcontrol.com.au to save time and money when collecting overdue accounts. It’s important to know the credit and business history of your new customers. You don’t want to do business with someone who has a long history of bad debts. Running a simple credit check of all new customers can reduce your risk and save lots of headaches later on. Also contacting any trade references is a great way to build an accurate profile of the people you are doing business with. If you already have an overdue account and you have made contact for payment 3 times or more without success then hiring a professional collection agency is generally the best next steps towards recovering your funds. An experienced and credible collection agency has the up to date knowledge of best practices and appropriate conduct to recover outstanding debts yet still protect your brand and your important customer relationships. Generally the introduction of a reputable debt recovery agency such as JMA Credit Control is all that is needed to get your debtor to pay immediately, if this doesn’t work our experience and skill in handling these delicate situations will allow you to focus on your business while we take the necessary action to recover your debts. If you have outstanding debts or would like to discuss developing professional terms of trade to protect your business, please call us on or leave a message here. At JMA Credit Control we have an outstanding track record and a NO Recovery, No Charge Policy so it’s a great idea to chat to one of our experienced consultants before don’t let your outstanding debts go on any longer.